When you import a flight track from ForeFlight , we now also import and display ForeFlight’s route. This provides you with a valuable tool to debrief “planned vs. actual”. You don’t need to do anything special to get this route – it’s part of our import process. 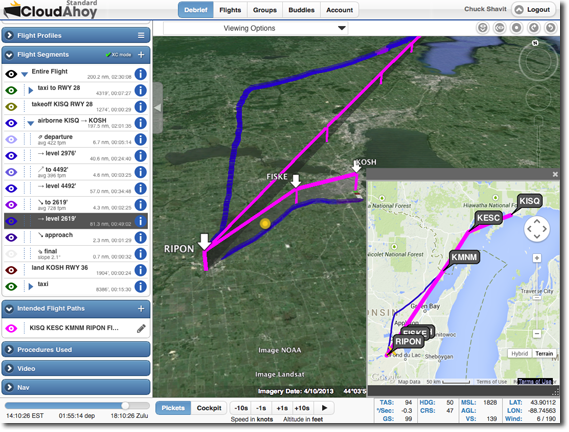 The example above shows CloudAhoy displaying ForeFlight’s route in magenta. The actual VFR flight followed the planned route from KISQ till KNMN, then deviated from the route to go around weather, and finally joined the route from RIPON to KOSH. The following Q+A will explain it in more details. 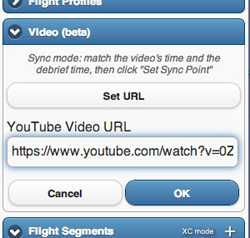 Q: Remind me – how do I import flight tracks recorded by ForeFlight? Q: I entered a flight plan into ForeFlight before takeoff, then modified it in flight. Which will be displayed in CloudAhoy? A: The last one. CloudAhoy imports the flight path as defined immediately before landing, i.e., the path including all the changes made in flight. Q: How is this feature related to CloudAhoy’s Intended Flight tool? 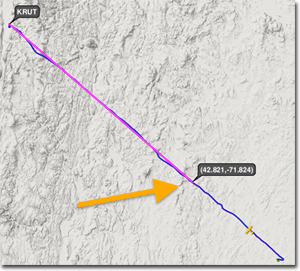 A: When we import the route from ForeFlight, we automatically create an Intended Flight segment, colored in magenta. After the flight’s import, you can of course modify the route, change the color, or delete it altogether. And you can use the symbol to hide or show it. Q: I see labels with coordinates. What do they mean? A: Your ForeFlight path probably did not start or end at a known fix. See the example on the right; the pilot flew for some time (the southeast section of the flight) before setting ForeFlight direct-to KRUT. As a result, the displayed magenta route starts at a coordinate where the direct-to was set. As usual, please email questions or feedback to us at dev@CloudAhoy.com. If your aircraft is equipped with Garmin G3X avionics, you can now debrief your flights using rich high-quality flight data captured by the G3X. It’s very similar to debriefing Garmin G1000 flights, which we described earlier. The G3X writes flight data into an SD card. To debrief the flight you need to import that data into CloudAhoy. This blog described how to do it. Important: please consult your G3X manual and/or the aircraft’s owner for details specific to your aircraft. Before turning on the avionics, insert an SD card into the SD Card slot. If you have both a PFD and an MFD, the card should typically be inserted in the master, i.e., the PFD. During flight, the G3X automatically writes the flight data into your SD card. After the flight, remove your SD card. You now have the flight data in the SD card. Insert the SD card in a card reader connected to your desktop or laptop computer. The SD card’s folder will appear on the desktop. Open the folder. It would typically contain a data_log folder, and in it the flight’s data file in CSV format. Open a web browser and login to your CloudAhoy account. Click the Flight Import button. Enter the flight’s pilot names, tail number and optional remarks (you can edit all these later), select the CSV file with the data, then click Import. The flight now appears in your flight list, and is ready to be debriefed. CloudAhoy can display the rich G3X data in graphical as well as numeric forms. The screenshot below has profiles showing a specific maneuver as the aircraft is pulling 2.4G while making a 62° left turn. CloudAhoy can display about 40 different flight profiles for flights imported from G3X, such as OAT, IAS, EGT and even transponder codes used during the flight. For more information about advanced flight profiles, see G1000 and G3X flight data with CloudAhoy profiles. For pilots flying a Garmin G1000 or Garmin G3X-equipped aircraft – we have just released a significant addition to your debriefing arsenal: extended G1000 or G3X data displayed as CloudAhoy profiles. It allows you to focus on such things as your power settings, engine information, and navigation accuracy. See also Importing flights from Garmin G1000 and Importing flights from Garmin G3X. 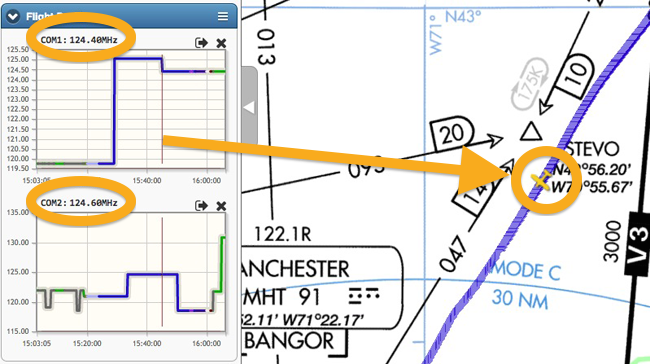 In what follows I describe G1000 profiles. G3X profiles are very similar. 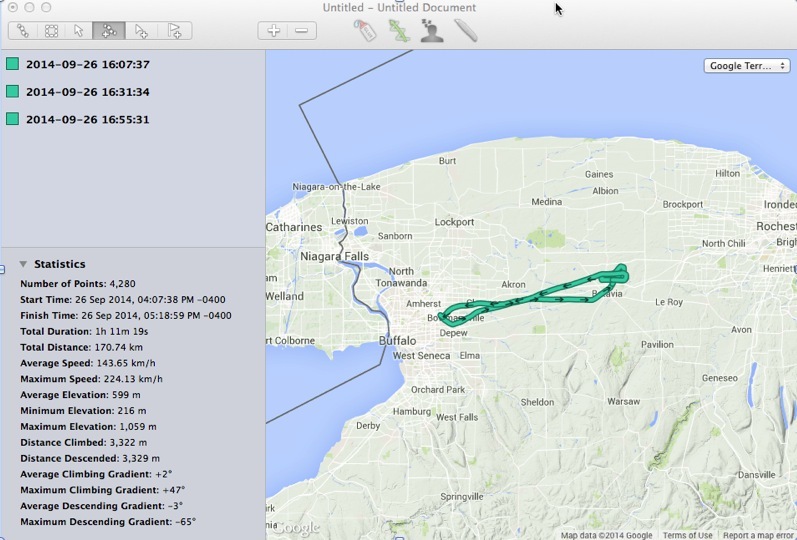 I used the G1000 data of a VFR flight which I recently flew from KPWM to KBED on a DA 40. The flight itself was uneventful, but still it’s interesting to view the rich data. Example – Navigation, horizontal CDI: this was a VFR flight and on the approach to landing I had to follow a Citation on the right base. Even though it was a visual approach, I loaded the ILS-29 approach into the G1000. The horizontal CDI profile shows the CDI deflection as I was approaching the localizer’s center beam, then overshooting it (oops) before intercepting the center line from the other side. 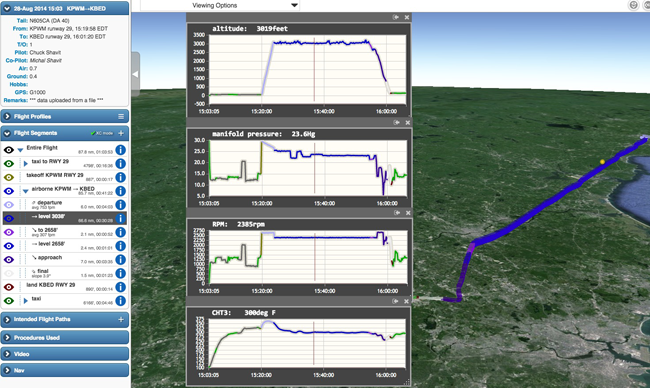 Example – Engine Data: I plotted the altitude, manifold pressure, RPM and CHT3 for the entire flight. Note the RPM=2000 during run-up, then set to max during the initial climb and during the final approach. 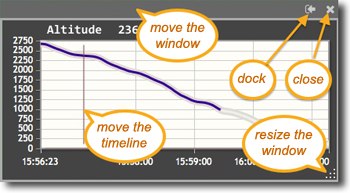 Example – Radio: in some cases it might be interesting to debrief the radio usage. The following screenshot shows my aircraft about 5 miles from Boston’s mode-C veil when I switched to Boston Approach 124.4 on the active COM1. COM2 at the time was tuned to KBED’s ATIS, 124.6. Soon after, I switched COM2 to KBED’s tower 118.5, then after landing to KBED ground 121.7, and finally after I parked I called for fuel on 130.8. Example – Altitude vs. OAT: Here I plotted the Altitude and the Outside Air Temperature profiles of the departure climb from KPWM to my cruise altitude of 3000′. Turned out the temperature dropped at a rate of 2.7°C per 1000′. The combination of the rich flight data from the G1000’s avionics with the flexible profile display of CloudAhoy provides a powerful debriefing environment. You can display any number of profiles simultaneously and move their timelines in sync, or watch them change during animation. To import G1000 flight data, see Import G1000 data into CloudAhoy (our post from August). To use CloudAhoy profiles see Improved Profiles (our post from August). To display a profile, click (or tap) the profiles menu icon in the Flight Profiles bar. You can select a standard profile (like altitude) as well as a G1000 profile. We organized the data into groups. Read the list like you read classified ads in a newspaper: top to bottom and left to right. As always, please let us know how this works for you. We would love to receive examples of your own debriefs using the G1000 or G3X. – drag the crosshair to move the timeline. in the Flight Profiles bar, and select the profile from the list. Initially a profile is displayed in the Flight Profiles section. This is called docked state. You can undock a profile by clicking the undocking icon . To close a profile, click its X icon on the upper right, or unselect it from the menu. Each profile has a vertical line to show the current time. You can drag the line to move the current time, which is exactly equivalent to moving the timeline’s slider – but allows for better accuracy. If you are the flight’s owner (i.e., one of the pilots), each profile’s size and location is saved, and will be restored the next time you debrief the flight. BTW, we now also save segment information windows , and the PIP window. 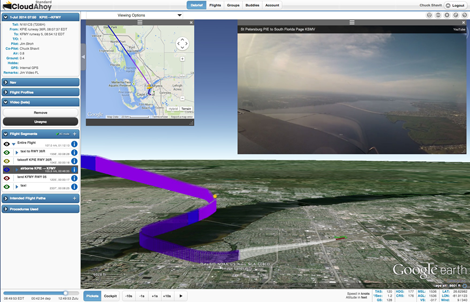 The screenshot on top was obtained by analyzing the flight in XC mode (click the button in the Flight Segments bar), selecting only the Approach and Final segments (see here about segments isolation) and displaying airspeed in docked state and altitude in undocked. Such a display can help in debriefing how stabilized the approach was. If your aircraft is equipped with Garmin G1000 avionics, you can now debrief your flights using high-quality flight data from the G1000. The G1000 writes flight data into an SD card. To debrief the flight you need to import that data into CloudAhoy. This blog described how to do it. Important: please consult your aircraft’s G1000 manual for details specific to your aircraft. Before turning on the G1000 system, insert an SD card into the top slot in the MFD. If you are renting the aircraft, you would usually bring your own SD card. If there’s already an SD card in the slot, consult with the plane’s owner. During flight, the G1000 automatically writes the flight data into your SD card. After the flight, remove your SD card from the top slot of the MFD. You now have the flight data in the SD card. Open the folder. It would typically contain a data_log folder, and in it the flight file in CSV format. Click the Flight Import button. An Enter the flight’s pilot names, tail number and optional remarks (you can edit all these later), select the CSV file with the data, then click Import. 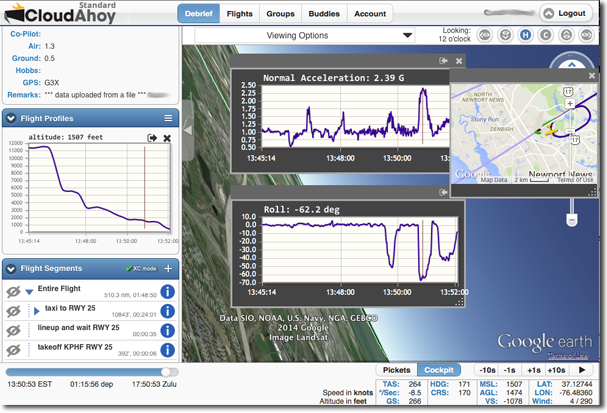 The rich G1000 data can be displayed using Flight Profiles. 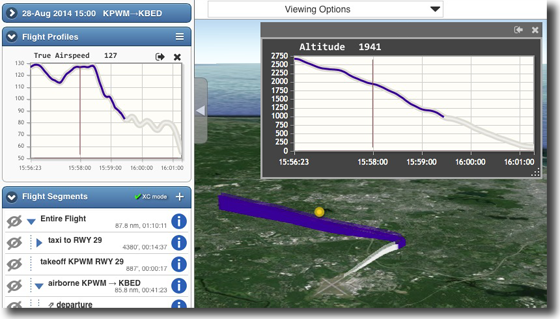 See G1000 flight data with CloudAhoy profiles. It is now possible to import into CloudAhoy flights which were recorded by ForeFlight. 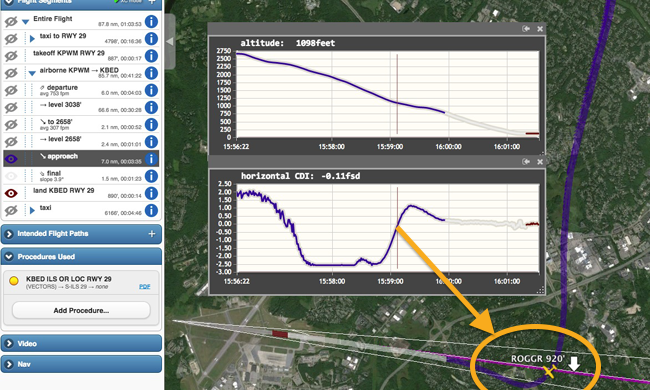 As many of you know, ForeFlight 6.3 introduced Track Log, a cloud-enabled flight recorder (see ForeFlight’s blog). We have worked with ForeFlight on integrating this feature with CloudAhoy, and we think you would like the results of this collaboration. Several CloudAhoy users have asked us about ForeFlight’s new feature, prompting us to write the following Q&A. Q: I am using ForeFlight’s track logs. Do I still need CloudAhoy? A: Yes. 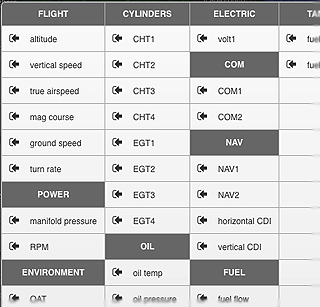 Flight debriefing is what we’re about, and our CloudAhoy Standard is what enables it – with things like auto segmentation and maneuver analysis, airspeed profiles, cockpit view, 3D instrument approaches, video and a lot more. ForeFlight’s Track Logs are roughly equivalent to CloudAhoy Free, our free flight track storage and display. Both products are free and you can use either one, or both. Check our CloudAhoy Free vs. CloudAhoy Standard comparison table. Q: I use Stratus. Can I import Stratus data into CloudAhoy? 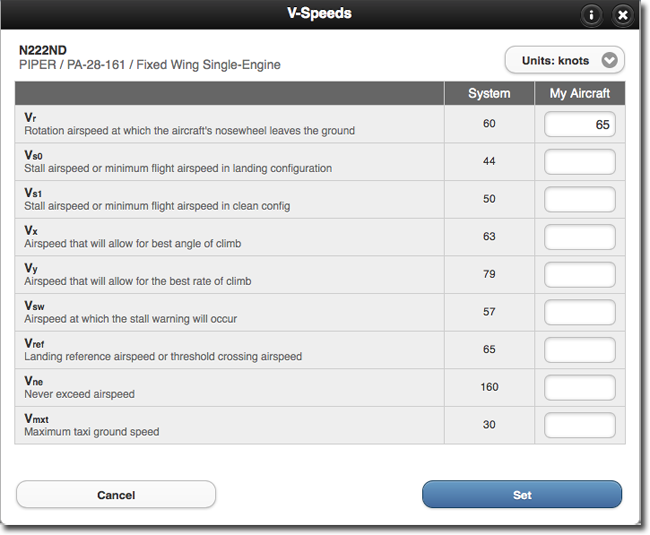 A: Yes, and this is a big benefit of the integration with ForeFlight. 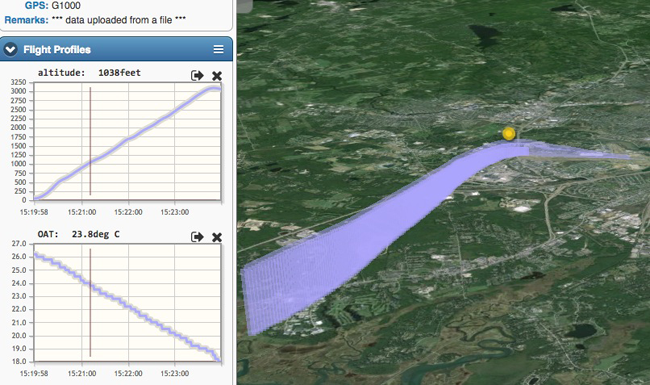 To debrief a flight flown with Stratus on board, create a track log in ForeFlight and import it to CloudAhoy. We logged flights with Stratus and imported them into CloudAhoy for debrief. Good stuff. Q: I’m already creating track logs with ForeFlight. Should I also log my flights with the CloudAhoy app? A: If you’re using Stratus, then no. Otherwise it’s a matter of convenience – do you prefer to hit the START button on CloudAhoy before the flight, or to import the flight from ForeFlight afterwards? We have used both ways, and are still undecided which is more convenient (both are very simple). 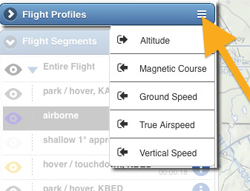 First you need to record a flight: tap REC in ForeFlight’s Maps tab. In ForeFlight’s More tab, select the flight in Track Logs. Note: when importing a flight from ForeFlight, CloudAhoy uses the track data from ForeFlight, and the pilot names, tail number and remarks from the CloudAhoy app. Before the import, you may want to verify that CloudAhoy has the correct pilot names, tail number and remarks. You can always edit this information after the flight was imported. A growing number of pilots take videos of their flights. We received many requests to embed a flight’s video in the debrief – and we have developed this capability. This new feature is now in public beta. Thank you our pre-beta testers for your help! Step 1: Upload the raw video to YouTube. It has to be raw, unedited. – Debrief the flight in CloudAhoy. – Copy your video’s YouTube URL into the URL field and click OK. 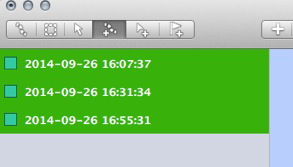 Step 3: Sync the video with CloudAhoy’s timeline. – Click Set Sync Point. Now the video and CloudAhoy are in sync. You would typically set Cockpit mode during the sync process, and set the times so that the video and the cockpit view will show a similar picture. The sync process has to be performed only once. 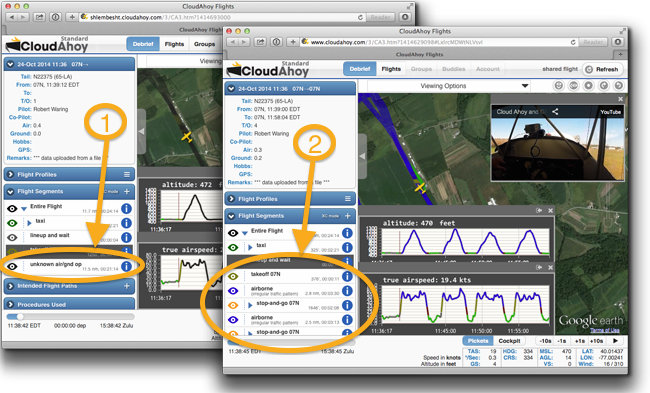 CloudAhoy will remember it the next time you debrief the flight, as well as when the flight is shared with someone. If you started logging the flight before takeoff, CloudAhoy’s debrief automatically sets the time at the beginning of the takeoff roll, and to sync it is usually easy to position the video on that spot as well. Tip: if the sync point is off by a few seconds, click Unsync, then use CloudAhoy’s +1s or -1s buttons as needed, then click Set Sync Point again. Tip: play cockpit view so both CloudAhoy and the video show a similar picture, then use CloudAhoy’s Point of View buttons to look at different directions. You now have two view points of the same flight. Try for example to have cockpit view look at the aircraft’s 6 o’clock while the video shows the forward view.